I trained as a stylist when I left school but only lasted a few years in a salon, I was young with no confidence. The colouring aspect fascinated me, even as a junior the senior stylist’s would ask my opinion on which colour to use on their clients (always through the back shop, never in front of a customer). I sometimes wish I had perused a career as a colour technician but back then I’m talking 20 years, I didn’t know how to go about it . Since the age of 16 I have coloured my hair, being in a salon it was hard not too. Starting out with the dreaded hi lighting cap and crochet pull through hook, it was a form of torture, seriously what we went through back then! But I was introduced to bleach and loved it. Now the process is isn’t as harsh switching to foils, I really enjoy going to the salon, it’s my treat to me, 3 hours of relaxation and pampering. I had the same stylist for 8 years until she left to have a baby. I moved around different salons and during this time I had a bit of a disaster with some bleach which left my hair quiet badly broken. I tried a lot to salvage it but eventually went for the chop. I found my current stylist, Brogan from Harrison Hair and Beauty in Irvine and I adore her. Having a good relationship & being able to speak with your stylist is important, they don’t have crystal balls, if you sitting in the chair thinking I don’t like this or your unsure say something. Do be afraid to speak out, your stylist wants you to return to them. Brogan transformed my hair from this to this. Salon visits are only half the story, when bleaching your hair the other half is up to us. 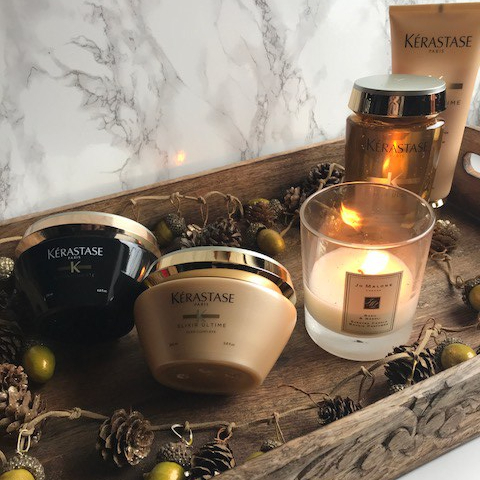 I’ve been using Kerastase for the past few months and I swear by it. I’ve always been a fan of the product. I would apply a hair mask maybe every 6 weeks or so but now I’ve switched to the shampoo, conditioner and hair treatments. My hair is much healthier and thicker with less breakage, the ends of my hair have stayed fuller instead of the straggled v shape it would always grow in.